4 Quick Tips on How to Choose the Perfect Photo to Base Your Oil Painting on. 1. Are your photos high res? I’ve found that the best oil portraits come from high-resolution photographs. Anything over 1 MB is excellent. It just means that when your artist studies your photograph, he’ll be able to see all the small details that he needs in order to paint you an exquisite oil portrait. Lesser quality photos are still ok to work from, we’ve hand-painted oil paintings based on photos taken from mobile phones but the higher quality and clearer the image the better. 2. How sharp is your photo? Your artist can only paint what he sees. Therefore your photo needs to clearly show the artist the colours and details you want to have painted into your portrait. The more in focus your photo is, (as opposed to a blurry photo) the better your oil portrait will be. Sharpness of photo is actually a key factor in what differentiates a good oil portrait from a great oil portrait. Try and avoid photos that show your subjects in strong sunlight or dark shadows as it doesn’t come across well in an oil painting. Having subjects squint if they are looking directly in the sun or are covered by shadows so you can barely see their faces is again not ideal. The great news is, your artist can change and alter the background of your portrait to however you want it. However, if you want the artist to copy the background as seen in your photo, it helps if your ideal background shows slight variations in colour and tones as this will give your oil portrait greater colour weight. Remember though, if the background in your photograph is very colourful and busy it will probably detract from the main subjects. Let us know when placing an order if you have any concerns about the background of your photo or if you would like any advice or alterations to be made. We’d love to hear from you! If you would like to add something, or ask a question concerning our oil portraits please leave a comment. Fabulous Masterpieces is the Premier UK Portrait Company. Curious to learn more about us? Then please visit the About Fabulous Masterpieces page. To celebrate The Royal Wedding, we’re offering a 15% discount off all wedding portraits commissioned by Monday, 2nd May 2011. All portraits are based on your favourite wedding photo and will be exquisitely hand-painted by one of our top portrait artists. Of all occasions, weddings are the events that most need to be immortalised in oils. Our portraits allow emotions, personalities and sentiments to shine through – creating memories that will last a lifetime. So much time, thought, energy and effort goes into planning the big day that a skilfully hand-painted oil painting of a treasured moment is truly a very thoughtful and touching gift to receive and is certainly an event that should be commemorated in oils. A favourite wedding photograph or special big day moment may earn a distinguished place in photo albums, but the glory of a great image often deserves a more artistic and meaningful touch. Fabulous Masterpieces’ portrait artists transforms treasured wedding photographs into unique, flawless portraiture carried out with the finest materials and carefully studied techniques, resulting in a touching gift destined for prominent display. Clients can omit various details or choose to have new elements added to a painting, making it especially personal. From capturing a bride’s radiant smile to evoking the import and weight that a wedding represents, Fabulous Masterpieces‘ portraits don’t simply commemorate; they celebrate. Far from being limited to large budgets or to the artistically inclined, the firm’s customised paintings can be ordered in various sizes and with as much or as little direction as desired, making it easy to give the perfect gift without enduring an expensive and tiresome hassle. Fabulous Masterpieces’ concentration on trusted Winsor & Newton oils, premium duck cotton canvas, and thoroughly trained, experienced portrait artists ensures each piece is truly worthy of its recipient. 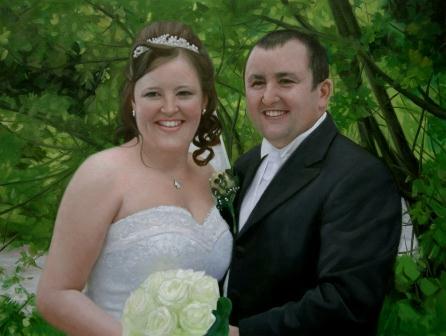 For more information on commissioning a wedding portrait, please visit the Wedding Portrait page. Remember to celebrate The Royal Wedding we are offering you 15% off if you order by Monday, 2nd may, 2011. Betchworth Park Golf Club is celebrating its Centenary this year. To mark the occasion, following the Club’s AGM in March, an oil portrait by Fabulous Masterpieces of the course designer, Harry Colt, was presented to the Club by Barry Thomson, a Club Director. 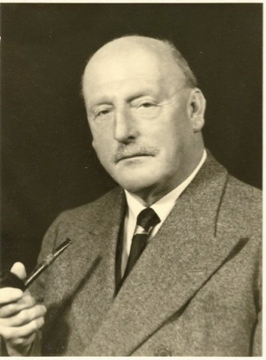 The oil portrait was based on an old black & white photograph (shown below) and our artist was asked to paint a realist-style oil portrait in colour using this photograph as inspiration. The artist used premium Winsor & Newton oils and expertly painted Harry Colt onto a high quality duck-cotton canvas. The oil painting took 3 weeks to paint and needed a further 2-3 weeks to dry before it could be delivered for its presentation. Are you thinking of commissioning an oil portrait? The whole process is so simple! Simply email or post us your photo(s) that you would like the artist to work from and we’ll do the rest. All portraits are strictly commissioned-to-order and take between 3 to 6 weeks to complete, as we also need to wait for the oils to have dried before we can deliver your painting to you! Prices for an oil portrait based on your favourite photograph start from £250. If you would like to receive a quote please email portraits@fabulousmasterpieces.co.uk. To see the portrait price guide, please click here. A Father’s day gift is all about celebrating the wonderful man who is your dad, who has done so much for you and in all probability you’re hoping to find a gift that reflects this. Commissioning a beautifully hand-painted oil painting of your father or a portrait of dad with the family is an extremely special gift to give him this Father’s day. Portraits genuinely make special gifts as it shows how much you care through the time and thought you’ve taken into finding the photograph to base your portrait on, to thinking about the moment you would like the artist to paint for your father, and what it would mean to him. All portraits are based on photographs that you send in meaning that the oil painting that you commission for dad is still going to be a complete surprise! As all of our portraits are based on a photograph or several photos, all you need to do is email your chosen photo(s) to tim@fabulousmasterpieces.co.uk or post them into us. We can paint things into your portrait or omit details that you didn’t like in your original photograph. We can work from several photographs too! Please take a look at our Portraits from Multiple Photographs to see examples. Commission an oil Portrait of Father and Son for Dad this Father's Day with Fabulous Masterpieces. Every portrait that you commission with our portrait artists is completely custom-made. Meaning, not only can we paint your portrait to any dimensions that you need, but if you wish, you can also have complete control in how you want your portrait to be painted. If you have ideas on how you would like the background to be painted for example and in what colours, please tell us. We’re really happy to listen to any of your ideas. Alternatively, if you want the artist to use their own judgement then that’s fine too! If you would prefer your father to choose what photograph he would like the artist to base his portrait on, we can send you out a lovely gift voucher with a personalised message from you. Prices start from £250 and if you would like to receive a quote please email portraits@fabulousmasterpieces.co.uk. To see the portrait price guide, please click here. 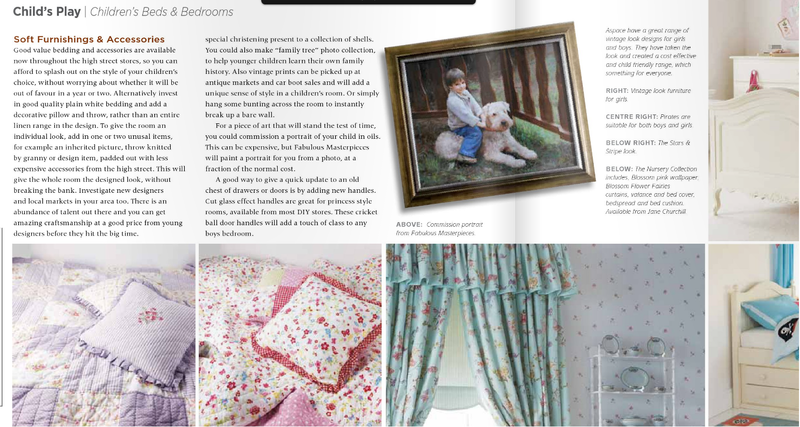 Beautiful oil paintings that capture a special moment is really an extremely touching & luxurious father’s day gift. It is literally something that dad can keep and proudly display forever! 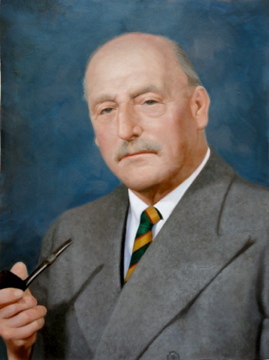 The cut off date for ordering an oil painting for Father’s Day is 5th May 2011. We deliver world-wide and delivery is free! Just a quick post to show you an oil portrait that Fabulous Masterpieces’ artist Sam Banks painted, has now been picked up by Traditional Homes & Interiors Magazine! Please click on the image to read. One of our beautiful child oil paintings. Please click on the image to enlarge. If you’ve ever thought about commissioning an oil portrait of your family or loved ones, please visit the Commission a Portrait page for more details. We actually have 2 child portraiture artists, Tom Lloyd and Sam Banks who paint in completely different styles. 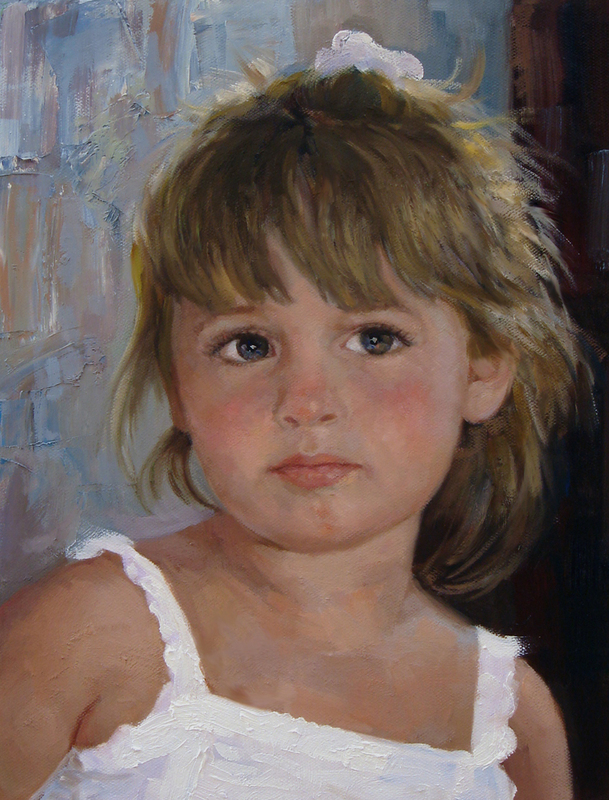 To take a look at examples of their portrait work please visit the Child Portraits page. Mother’s Day Portraits Based on Your Favourite Photo of Mum by Fabulous Masterpieces. A Mother’s day gift is all about celebrating the wonderful woman who is your mother, who has done so much for you and in all probability you’re hoping to find a gift that reflects this. Commissioning a beautifully hand-painted oil painting of your mother or a portrait of her with the family is an extremely special gift to give her. Portraits genuinely make special gifts as it shows how much you care through the time and thought you’ve taken into finding the photograph to base your portrait on, to thinking about the moment you would like the artist to paint for your mother, and what it would mean to her. All portraits are based on photographs that you send in meaning that the oil painting that you commission for her is still going to be a complete surprise! A touching family portrait of her with the children. Portraits of her with her siblings or with her partner. And of course a beautifully hand-painted oil portrait of her looking her best that she would love to proudly display. As all of our portraits are based on a photograph or several photos, all you need to do is email your chosen photo(s) to portraits@fabulousmasterpieces.co.uk or post them into us.We can paint things into your portrait or omit details that you didn’t like in your original photograph. We can work from several photographs too! Please take a look at our Portraits from Multiple Photographs to see examples. If you would prefer your mother to choose what photograph she would like the artist to base her portrait on, we can send you out a lovely gift voucher with a personalised message from you. Beautiful oil paintings that capture a moment that is really special for your mother is an extremely touching gift and is literally something that she can keep and proudly display forever! The Cutest Oil Portrait Ever! 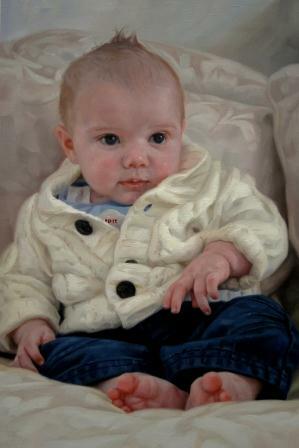 Just a quick post to show you the most recent baby portrait by Fabulous Masterpieces’ artist Tom Lloyd. Hand-painted with premium Winsor & Newton oils onto a duck cotton canvas this will be something the whole family can treasure and is a celebration of his first stages in life. Beautifully hand-painted based on the parent’s favourite photograph of their son, the portrait took 3 weeks to paint with a further 2 weeks needed for the oils to dry. To see more examples of Tom’s portraits, please visit the child portrait page. Prices start from £250. All Fabulous Masterpieces oil portraits are custom-made to your specifications and can be hand-painted to the exact dimensions that you require. For a quote or more info please contact us or visit the portrait page.